Hi friends! Ok, I’ve been updating my Instagram stories with sneak peeks of the hardware I’m using in the new house. It’s been sooooo so fun to hear your reactions! However, there have been so many messages and inquiries so I’m going to share a little preview of each space with the hardware on it and link them below. I wanted to wait and share it in our reveal of each room but some of you are also in the middle of building and remodeling so I’m going to share them twice. Here’s a sneak peak of my hardware at our new house, or “Tall Trees Lane” as we call it. In my all-white kitchen, I’m using these beautiful bar pulls in Golden Champagne from Amerock. 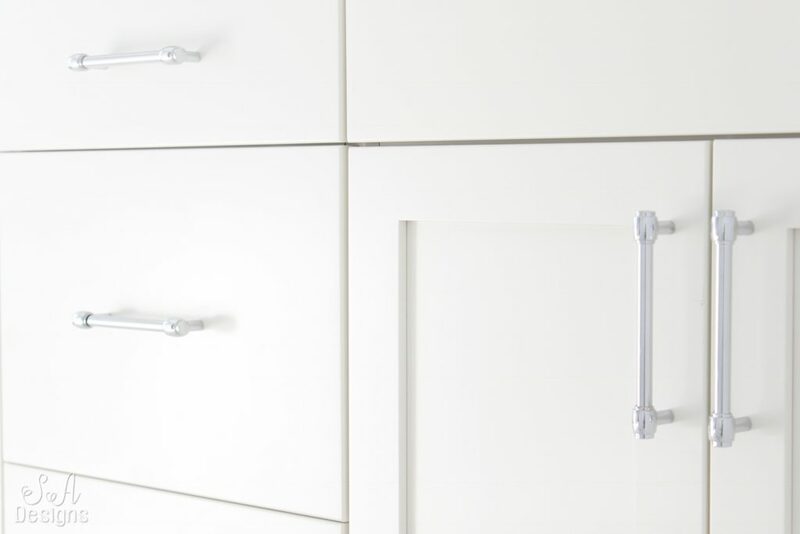 I had measurements from my cabinet guy and designed the kitchen with 5 different sizes of pulls. 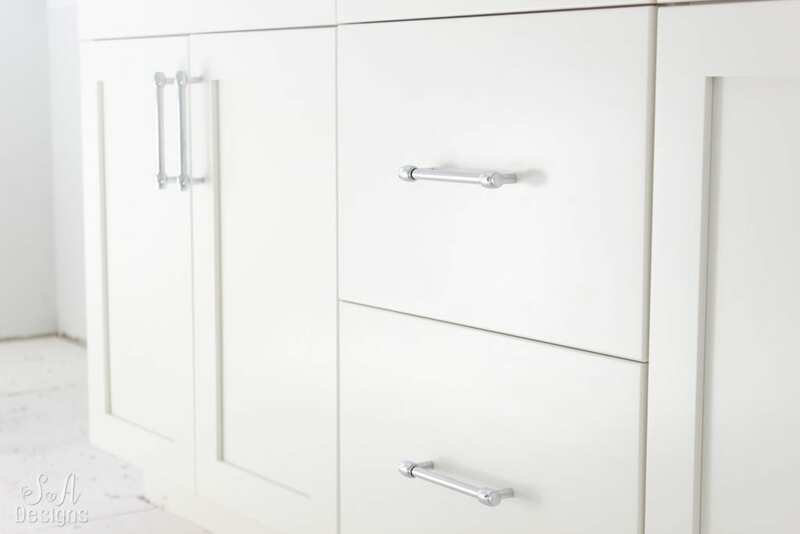 I didn’t want to use any knobs on the kitchen but they have coordinating ones if you want them. I’ll link them below as well. If you aren’t wanting the same Golden Champagne finish, they also carry this pull in 6 other fabulous finishes. Amerock has such gorgeous lines of different hardware. I met them back at the Design Bloggers Conference this year and was really impressed with them. They’ve been amazing to work with and I highly suggest using them. 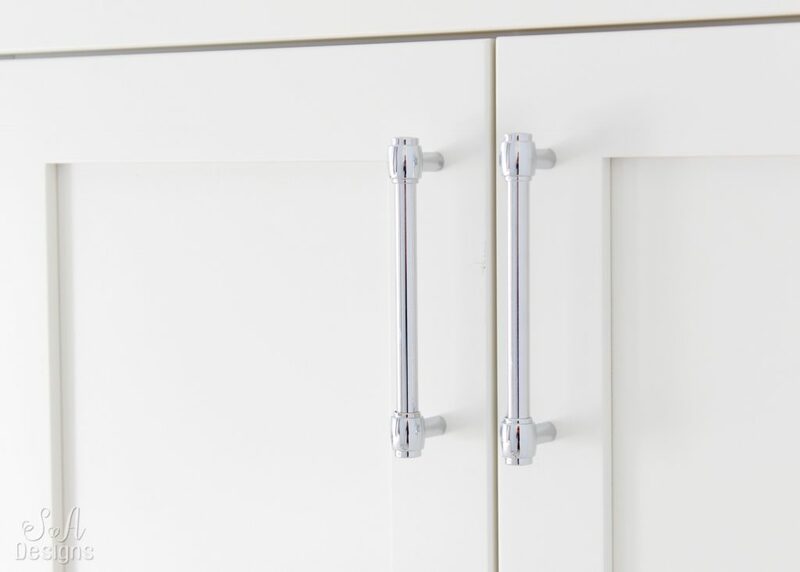 I’ll be sharing more of them and all this hardware next month in my kitchen reveal! For our downstairs guest bathroom, I decided to keep a nice flow and use brass tones like I did in the kitchen. 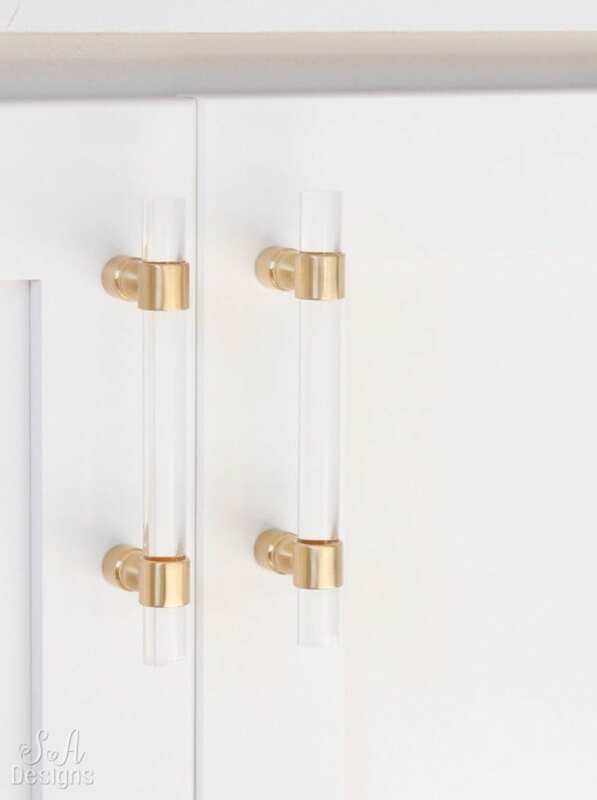 I came across these gorgeous Lucite Brass pulls online but they were so darn expensive. Some pulls were around $30 a piece. I only needed 7 pulls but still…that was ridiculous. So I kept searching and found the exact pulls for a way better deal HERE. Some of you have asked if they come in chrome also, so I’m going to link those for you below as well. 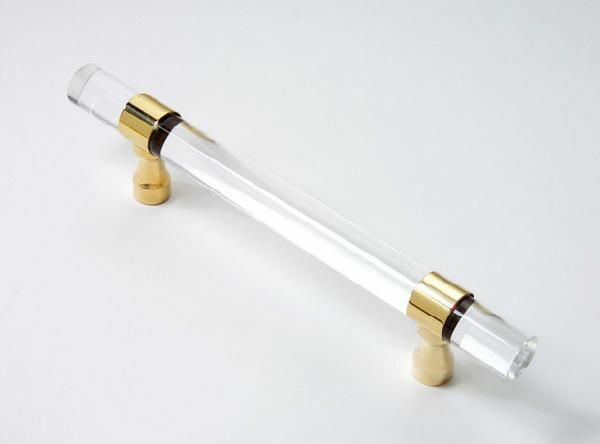 While doing brass hardware downstairs, I wanted to use all polished chrome hardware upstairs. 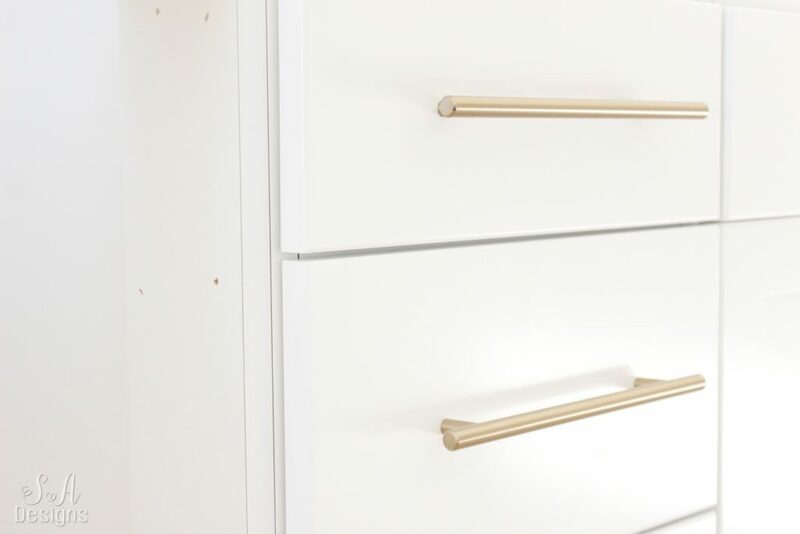 I was on Hardware Resources‘s website and found these gorgeous “Hayworth” polished chrome pulls that I used for the master bathroom, the kids’ bathroom, and in our laundry room. Aren’t they stunning?! I wanted them to go perfectly with the plumbing and mirrors and lighting. It’s clean and bold. I absolutely adore them. The quality is amazing and I just loved working with Hardware Resources. Please check them out also! Although I used all 6″ pulls, I’ll link the pulls here below in a few different sizes. They also come in a few different finishes. If you didn’t get a chance to see my interior paint colors I chose, you can read all about that HERE. Please check back soon! We will be finished with our new home in just less than 3 weeks from now and will be moving in. I’ll be doing individual blog posts to reveal each room and include, again, all of my sources and you’ll get to see pictures of space completed and styled. I can’t wait to share our home with you! I would love it if you subscribed at the top of the page in order to receive my weekly emails of all my latest blog posts and hear about digital printables & freebies, as well as sales or new items in My Online Shoppe. You can also follow me on Instagram, Pinterest, and Facebook to see what I’m up to in creating a home and lifestyle of inspiration! Oh, I love the hardware you chose, Summer! I am looking for hardware for our beach house, I will be opening all the links you shared!! Kellie, thank you soooo much! I can’t wait to see what you choose! I love the hardware you chose Summer. How did you decide which size pulls to use in your kitchen? 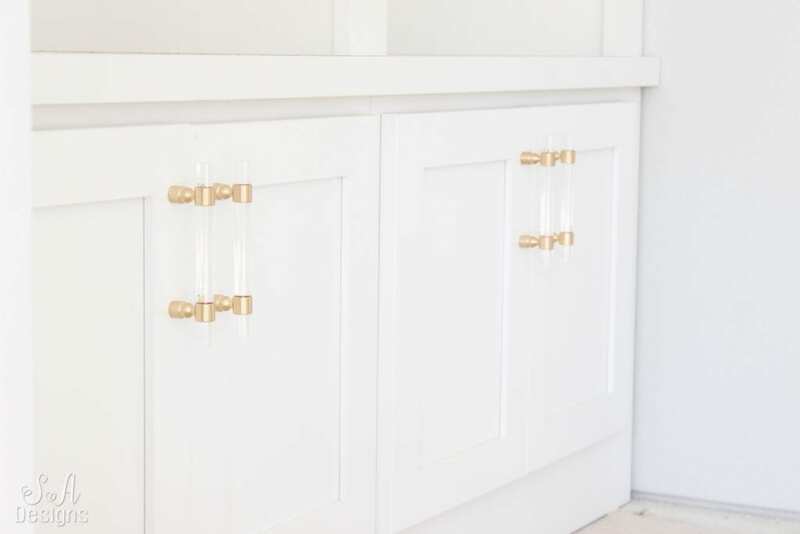 We are in the mist of a kitchen remodel and I need to purchase the pulls asap. I have gone with all drawers for the base ‘with the exception of the lazy Susan, sink base, and 2 -12″ cabinets. 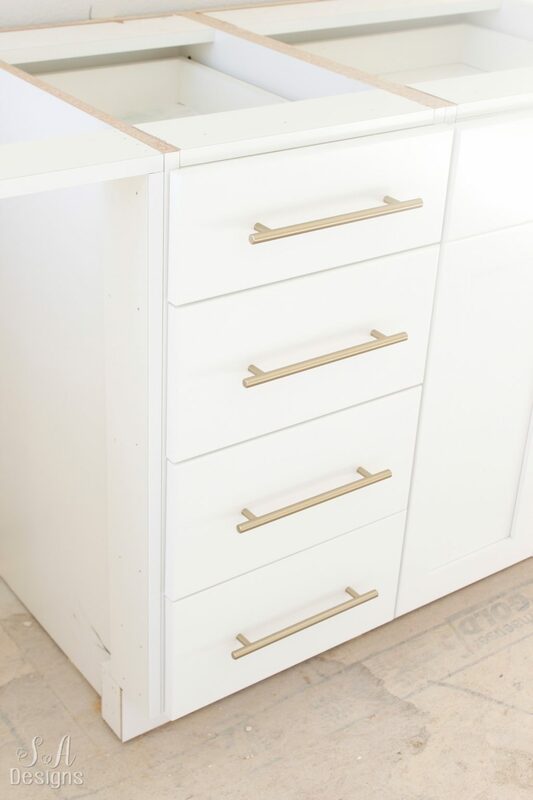 These are the drawers sizes and number of drawers….. 18″ (1), 21″ (8), 24″ (10), 27″ (4), 30″ (1).